Christmas has come to the small college town of Bedford, but instead of joy the season brings a horrific surprise, in the form of a warpped psychopath who’s murdered a teenage girl. The elusive lunatic is now squatting in the dusty attic of a local college sorority house, waiting to be set-off again. For the thinning group of sorority sisters left in the house, it will be a nightmare as they’re plagued by ominous phone calls and the disappearence of one of their own, all the while oblivious to the deadly threat that lurks within their home. A threat that is creeping closer with every passing minute. 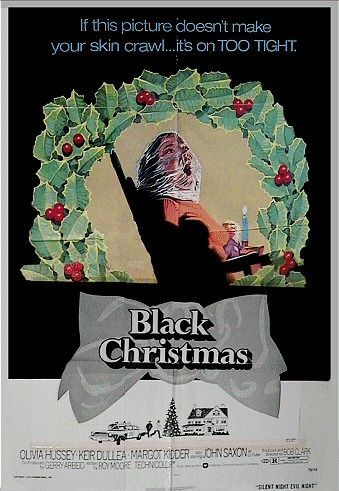 Bob Clark’s Black Christmas is a tour de force of a horror film! It’s a film that has rode low under the radar since its release in 1974, but in previous years has been re-discovered by the horror community and finally hailed and praised for the brilliant masterpiece that it is. For me, words never quite do justice to this film. Black Christmas strikes such a deep chord that it almost must be viewed to understand its unsettling impact. It is the perfect film to terrify one’s self with in the late night, with the phone unplugged of course! On every level Black Christmas is a finely-crafted film. Story-wise it is an engrossing ride through extreme emotion. Clark weaves into this plot such moments of profound eeriness, moments of sharp comic relief, and ultimately a climax that so utterly intense you may find yourself sweating. This is all capped off with a conclusion that is the perfect final note to this disturbing tale. Clark’s direction is top-notch, as we are given fantastic cinematography, particularly in lurking point-of-view shots from our murderous villain. The cast is excellent, featuring such notable stars as Olivia Hussey, Keir Dullea, John Saxon, and Margot Kidder, all of whom deliever fine performances. Even the supporting cast, which sports such memorable Canadian actors as Art Hindle, Mariam Waldman, Andrea Martin, and Douglas MacGrath, are good here. One element that truly brings out the haunting, dark atmosphere of this film is the music score by Carl Zittrer. Zittrer’s music here is best described as simply “deranged” as the composer perfectly captures the menace and chill of this tale. All of these factors combine to make a film that is simply one of the genre’s best. Its influence can be felt in such slasher classics as Carpenter’s Halloween (1978), Walton’s When a Stranger Calls (1979), and Cunningham’s Friday the 13th (1980). 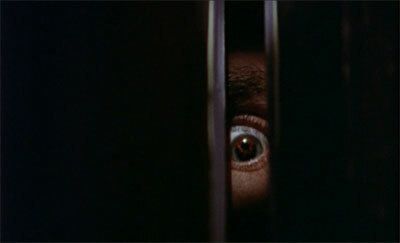 So, needless to say, Black Christmas is one of the true milestones of the slasher subgenre. Two more mini reviews from fellow fans of the slasher genre as they each talk about their slasher favorites. Thank you Cory and Wesley for your awesome selections! Only a few hours left to enter the contest so make sure to write your reviews soon! All you have to do is go to the Slasher Studios Facebook Page and select a picture from your favorite slasher movie and do a small write up and we will feature you and your review on our site. One special review will win a free autographed copy of Teddy! 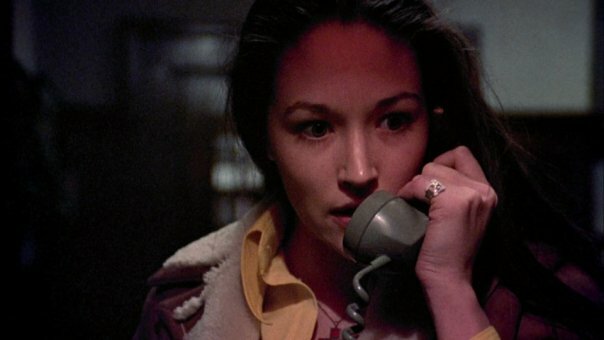 Black Christmas (1974) may not actually hold the crown for starting the slasher genre but it pioneered so many of the elements we love in the genre, such as the killers POV (yes as did Peeping Tom). What’s more it used them more effectively then a number of copycats that would follow. Utilizing the warm atmosphere of Christmas time but turning it into one of dread. Mixing shocks, tension, character moments and black humor to make a more rounded film overall. It also perfectly sets most of the story in a generally creepy on its own merits sorority house while offering audiences insights into the mind of a truly frightening serial killer the film manages to create a sense of dread as the story progresses. It eloquently paints it killer bit by bit blending back story with the multi-layered personality at the end of the phone. The audience hanging on every eerie word spoken, unlike most phone horror’s the film’s calls stand head and shoulders above all others. The cast do a fine job of behaving believably in the situations, including final girl Jess going back upstairs for her friends despite the news she has been given by the less then tactful police officer Nash. The girls are drawn as humans with thoughts feeling and emotions and not types, Margot Kidder standing out whist drowning her sorrows at the bottom of a bottle while providing some subtle comic relief. The perfectly staged ending that plays on the audiences suspicious of who this killer may be and the wry promise of a reveal to ‘whodunit’ leads to a pitch perfect epilogue that manages to leave you as chilled as the snowy surrounds of the sorority house and is a truly perfect end to in my opinion the quintessential slasher film. 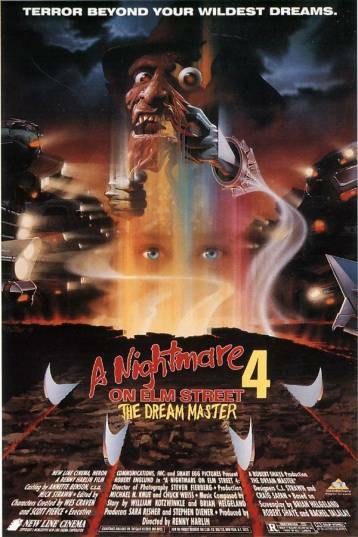 Another favorite slasher film of mine is A Nightmare on Elm Street 4: The Dream Master. As a child walking down the horror aisle in my local video store so many VHS covers caught my attention but none like Nightmare 4. Freddy was at his greatest in this sequel. I love everything about this film. From Freddy’s sweater to his one-liners to the soundtrack and then the creative kills. This is my favorite Nightmare on Elm Street and I seriously doubt that opinion will ever change :P plus if John Hughes made a horror film this would be the outcome. Also the cast is pretty great as well! Forget about the 2006 version, THIS movie is where the terror really started. It’s time for Christmas break, and the sorority sisters make plans for the holiday, but the strange anonymous phone calls are beginning to put them on edge. When Clare disappears, they contact the police, who don’t express much concern. Meanwhile Jess is planning to get an abortion, but boyfriend Peter is very much against it. The police finally begin to get concerned when a 13-year-old girl is found dead in the park. They set up a wiretap to the sorority house, but will they be there in time to save a young sorority girl from being murdered? “Black Christmas” is that rare horror movie that gets everything right. This is a movie that just oozes atmosphere. Every frame is dripping with dread and setting the film on the Christmas just adds to the excitement of it all. Not only this but the film is also scary as hell with some excellent performances and an ending that is sure to give every horror fan chills. What is the most incredible aspect of this groundbreaking slasher film? Throughout the entire film, we see various sorority girls getting hacked to death and receiving strange telephone calls. What we don’t see is our psycho, Billy. No motive, no reason, no face, no man..Billy could be anyone of us. If that doesn’t make a true psycho, I really don’t know what does. “Black Christmas” is quite simply the best horror movie I’ve ever seen. Some give the credit to “Halloween” to being the first real American slasher film but that simply is not fair. “Black Christmas” did it first and did it better. It is the grandmother of the slasher film, four years before “Halloween”. “Black Christmas’” power is impossible to deny; its characters are compelling, the imagery poignant, and the acting top-notch. If you haven’t seen it yet, you are in for one scary “Christmas” treat.